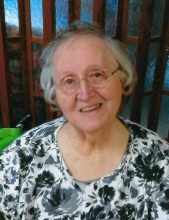 Mary Jane Hoehn, of Westland, age 86, passed away April 11, 2019. Beloved wife of the late James Hoehn. Loving mother of David Hoehn and Lisa (Christopher) Price. Dear grandmother of Justin (Jessey) Price. Sister of Catherine Basel. Visitation at the R.G. & G. R. Harris Funeral Home, 15451 Farmington Rd., Livonia, Tuesday, April 16, 2019 from 2 - 9 PM with a Rosary Service at 7 PM. Instate at St. Thomas A Becket Catholic Church, 555 S. Lilley Rd., Canton Wednesday from 10:30 AM until her Funeral Mass at 11 AM. Please share a memory of Mary on her Tribute Wall. To send flowers or a remembrance gift to the family of Mary Jane Hoehn, please visit our Tribute Store. "Email Address" would like to share the life celebration of Mary Jane Hoehn. Click on the "link" to go to share a favorite memory or leave a condolence message for the family.